Great New York style pizza. Lately, I’ve been having tons of “uppity” Napoletana style pizzas, so I was hesitant to come to Pasquale’s when my brother suggested it last weekend. I admit, I’ve become quite of pizza snob in the last couple of years. “New York style? Pshh, I only want real Italian pizzas.” Well, I bite my tongue now because Pasquale’s makes some darn good New York style pizzas. Pasquale’s has been centrally located in the heart of Irving’s food grotto, before the area became a food grotto. Proof that Pascuale’s stands the test of time. At the front of the restaurant, you’re greeted with the pizza chefs stretching out their dough and assembling the toppings. You’re seated in a rather large seating area. This space is great if you want to bring a party of 15-20. Pasquale’s has an extensive menu options including classic Italian dishes, pizza, pasta, stuffed potatoes, burgers, sandwiches and steaks. Now-a-days, local pizzerias are charging anywhere between $20-$30 for a 6 slice pizza. It’s insane how expensive a pizza dinner can cost you. Well, don’t be alarmed at Pasquale’s! An extra-large pizza only cost us under $25. The pizza was HUGE. Twelve slices and 18″ in diameter. With 3 dudes with a big appetite and myself, we even had a slice left over! 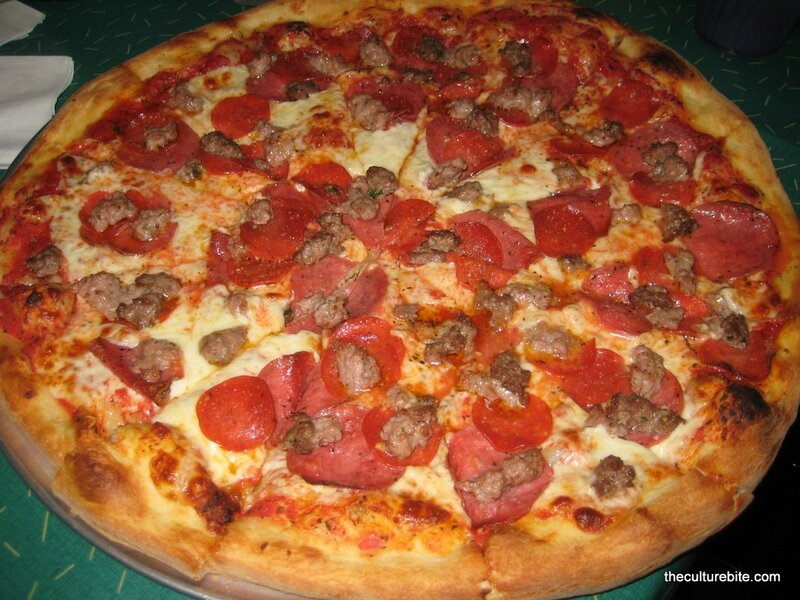 Meat Eater’s Pizza – This extra-large pizza was topped with salami, pepperoni, sausage and beef. The crust was thin and crispy. The cheese was melted and gooey. The meaty toppings were plentiful. This deliciously greasy pizza was uber satisfying. It’s the kind of pizza you want to fold in half and shove it down your throat with a tall glass of coke. Yum. I’ll definitely come back here again to try their seafood pizza. Oh yeah, they also do delivery.